A 33-story building slated to be built on Riverside Boulevard in New York's Upper West Side has citizens and city officials in an uproar, according to an article recently published in the New York Times. The building is going to contain 274 units, but 219 will be sold at market rate as condos, and 55 will be apartments for rent to people making 60% or less of area median income. 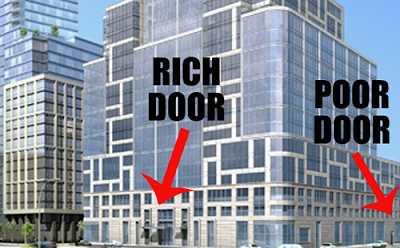 What has people in an uproar is the fact that the condos and the apartments will have separate entrances. One one hand, people are outraged with the separation of classes and view the separate door idea as segregation. On the other hand, there are those who feel we have to make compromises in order to provide more affordable housing for New York's 50,000 residents in need of homes. Is the separate entrance justified, or is it segregation? What do you think?